April, 2019 – If you have never played on Party Poker and live in or visit New Jersey often, what are you waiting for? New Jersey is only one of three states in the USA where you can play poker legally on state-run online gambling sites, the other two being Nevada and Delaware. 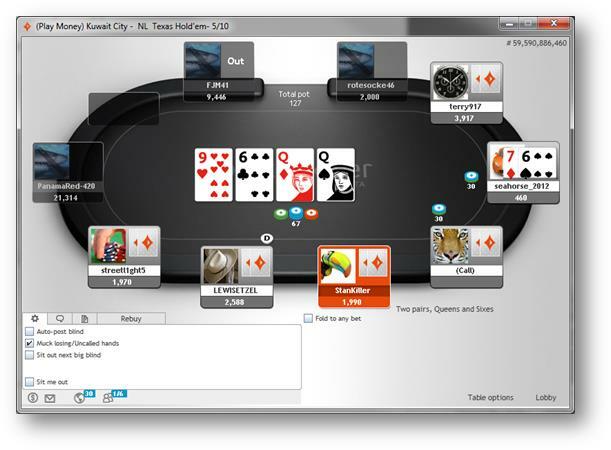 Party Poker is one of almost a dozen of such sites launched in New Jersey in November, 2013, when online gambling in that state was first introduced. But what makes Party Poker special is that of all the legit real money online NJ poker rooms, it is No. 1 in traffic. This is no surprise since it is affiliated with the Borgata Hotel and Casino, which is No. 1 in revenue of all of the Atlantic City casinos. If you would like to know more about what the leading legal online poker room in New Jersey has to offer, this comprehensive and unbiased Party Poker New Jersey legal poker review by the experts at PokerSites.us is must reading. Nothing is more frustrating to an online poker player in America than logging on, only to discover that your favorite game is either not available at all or there are too few players to make playing worthwhile. At Party Poker, unlike at some other online poker rooms open to U.S. players, you never have that problem, even in the off-hours. Whether you play for low stakes, mid-stakes or high stakes, you can always find the real cash game or tournament you want. And if you are into social media and showing off your “Accomplishments” to your friends, Party Poker offers plenty of opportunity for that, too. Playing at Party Poker is like being at a non-stop party! What a difference a year makes! When Party Poker was first launched in November, 2013, the maximum Welcome Bonus was only $100. Now it is 10 times that amount! All new players signing up the site receive a 100% match bonus on their first deposit up to $1,000. The bonus is released in four increments as you continue to play. However, all real money poker play, both in cash games and tournaments, counts. And with all the action that this site has to offer on a tremendous variety of games day and night every day of the week, even if you go for the maximum bonus, it can be cleared in less time than you think. Of course, if you are a small player with a more limited bankroll, you don’t have to make a maximum deposit. Simply deposit what you can afford and take a lesser bonus. Making your initial deposit is easier than you think. Most gambling sites, if they are open to American players at all, only offer them a very limited choice of deposit options. The Party Poker New Jersey site is a little better in this respect. Your deposit options include MasterCard, Visa, Discover, Neteller, Skrill (Moneybookers), Online Bank Transfer, and in-person cash deposits at the cashier’s cage at the Borgata in Atlantic City. We need to warn you that some players have had difficulty using a credit card because their bank would not process transactions for online gambling purposes. Therefore, using one of the other deposit methods might be less of a hassle. If you can conveniently get to the Borgata that might be best option of all because not only all of your deposits, but also your withdrawals, are instantly available 24/7. In addition to the regular Welcome Bonus, just for signing up, there is a $25 free no deposit required bonus waiting for you. It consists of a $10 credit for poker regular and fast forward cash games, another $10 credit for casino games, including jackpot slots, and a $5 credit for tournaments. But you will have to hurry. From time to time, as you continue playing, you may qualify for other bonuses as well. When you do, you are notified by email. It would be a shame to sign up as a new real money player and miss out on a bonus as generous as this one because of one small mistake at the time of registering. Therefore, in order to ensure that you do get the full value of the bonus, we recommend signing up with our exclusive 2019 Party Poker bonus code PSUS25, which gives you $25 Free if you are a new player and 100% free signup bonus up to $1000. The rules for clearing the Party Poker Welcome Bonus are simple. Every $1 you contribute to the rake or spend on tournament fees earns you two points. Every 4 points you earn playing poker counts in turn towards clearing $1 of the bonus. We assume you are reading this Party Poker review for legal New Jersey online gambling because you either live in New Jersey or you visit the state on a frequent basis. Otherwise, you will encounter problems playing. In order to play for real money on nj.partypoker.com, or on any other legal gambling site run by the State of New Jersey, you must be at least 21 years of age and physically situated in New Jersey at the time. The site uses Geo Location software to verify that in fact you are in New Jersey. If you are not, you can still access your account to make deposits and withdrawals, but you won’t be able to play in any real cash games or tournaments. NJ.PartyPoker.com and BorgataPoker.com use the same software and even share the same player pool. Both sites are powered by Bwinparty. However, the promotions and loyalty rewards on the two sites are different, so if you would like to play on both sites, you will need to create two separate accounts. You have a choice of three convenient ways of logging on to play. The first is the traditional downloading of the Party Poker software onto your computer. This will take only a few minutes of your time and give you full access not only to all of the Party Poker cash games and tournaments, but also a variety of customizable features to enhance your playing experience. The downloaded version is compatible with both PC and MAC computers. Or, if you prefer, another option is the no download instant play flash version which allows you to play on any browser so you don’t have to be tied down to your own home computer. You can play on a very wide variety of devices. The flash version works on PC, MAC, and Linux computers. Your third option is to access Party Poker on your mobile device. While, except for sit and gos, the apps don’t support tournament play, there are still plenty of cash games to choose from and, for anyone on the go a lot, the convenience of anytime anywhere access on your smartphone or tablet is unbeatable. Party Poker apps work on both Apple iOS and Android devices, and downloading onto your iPad, iPod Touch, iPhone, or smartphone is easy. You can play on either the WiFi 3G or 4G network. Instructions on how to download each app are provided on the website. You can also contact Customer Support if you have any questions. 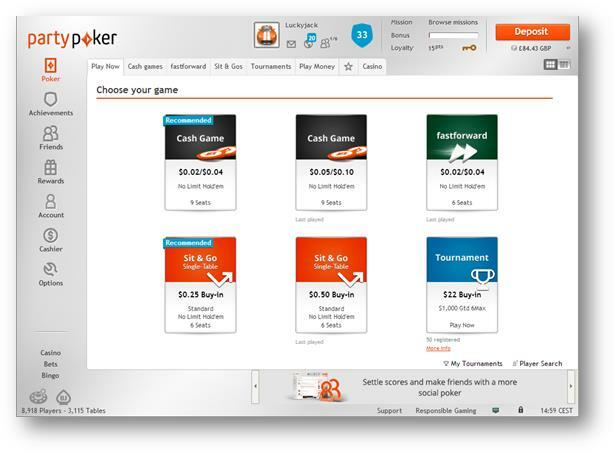 Mobile players have the same choice of either real money or play money games as computer players since the Party Poker apps support both. There is even a cashier in the apps so you can use your mobile device to register, deposit, and withdraw funds just like you would on the computer. Another nice feature is that you can review your hand history on the mobile apps. The chart below shows the minimum and recommended system requirements for Party Poker computer play. Most online poker rooms are not open to U.S. players at all, and those that are more often than not have a very meager game selection. If you are contemplating opening a PartyPoker.com account, you will be pleased to know what our Party Poker New Jersey legal poker review has revealed about the game choice on this site. Unlike some other sites open to U.S. players, Party Parker brings you a wide selection of both ring games and tournaments. Cash game options include Limit, Pot Limit, and No Limit Hold ‘em, Omaha and Omaha Hi-Lo and 7 Card Stud and 7 Card Hi-Lo. Limit hold ‘em games range from as little as .02/.04 to as high as $30/$60 and No limit hold’em, which is by far the most popular game, ranges from .05/.10 up to $25/$50. In other words, there is a wide enough range to accommodate most players. The upper limit for stud and Omaha games, however, is just $5/$10. In addition, to all of these standard cash games, Party Poker offers another version of the game called Fast Forward Poker. The distinguishing feature of this game is that if you don’t like your hand, you can fold right away out of turn and immediately be seated at a new table with new players. Otherwise, after the hand is completed, you are switched to a new table. The advantage to Fast Forward Poker over regular poker is that you don’t spend idle time sitting around waiting for hands to complete so you get to play a lot more hands. The disadvantage is that you don’t have an opportunity to study your opponents. Fast Forward Poker, like the regular Party Poker cash games, can be played on your smartphone or tablet, as well as on the computer. Party Poker has a very wide variety of games, tournaments, and offers play on most devices. If you like the thrill of tournament play, Party Poker has more excitement in store. With guaranteed multi-table tournaments and sit and gos both running day and night, and for added variety, shootouts (where the top 3 at each table advance), heads-up tournaments, and bounty tournaments, the action is nonstop. The site’s biggest weekly tournament is the Sunday 50K guaranteed tournament which takes place every Sunday at 5 p.m. EST. The buy-in is a hefty $200, but you can win your way in with a qualifier for as little as $5. There are also $10,000 daily guaranteed tournaments, with a minimum payout of $2,000 for first place. These tournaments take place at 7 p.m. with a buy-in of $100 (or again, win your way in with a cheap qualifier). And you won’t want to miss the monthly 100K guaranteed tournament, with a $200 buy-in (or qualifier option). Of course, there are lots of smaller tournaments, too. Or try your luck in one of the “Dream Seat Series” special tournaments with concert or sporting event tickets up for grabs. The choice is entirely up to you. But wait, if you want even more action, the party is just getting started. Every Friday at 5 p.m. you can take part in a Facebook Freeroll and maybe win a tournament ticket worth $25. You also have the opportunity to complete designated “missions.” Each mission accomplished not only gives you bragging rights, but also actual rewards like cash, tournament tickets, points, and bonuses. On the other hand, whenever the cards aren’t going your way and you need a break from poker, you have it with a convenient switch to blackjack or roulette, which are also available on the site. 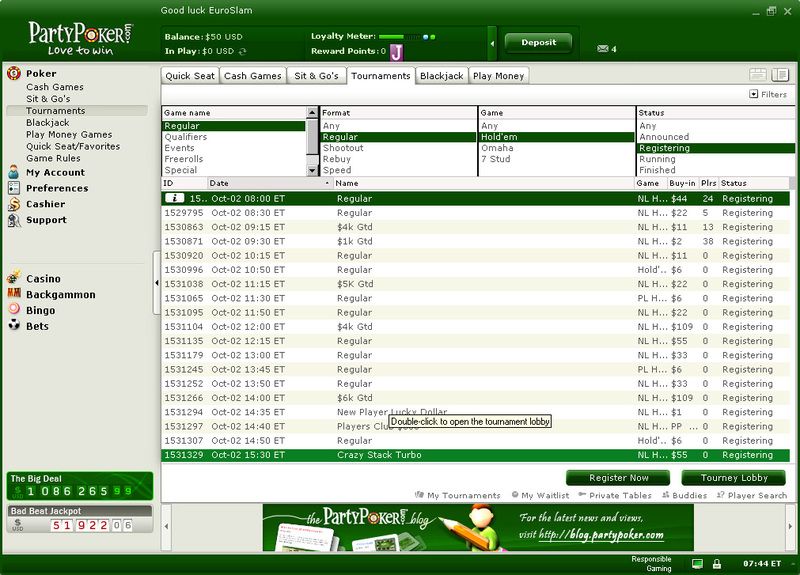 Party Poker is not the fishiest site by any means, but at least at the lower stakes, the level of competition is soft. As you move up in stakes, you will run into more highly skilled players. So, unless you, too, are an experienced player at the same skill level or better, the higher limit games will be tough to beat. Keep in mind that this site attracts a lot of young Internet savvy aggressive players. On the other hand, there will always be some players on the site who are primarily casino game players rather than poker games and that will help to balance the field. An important part of our comprehensive Party Poker review of this legal online poker room for New Jersey players has entailed a reevaluation of special distinguishing features. 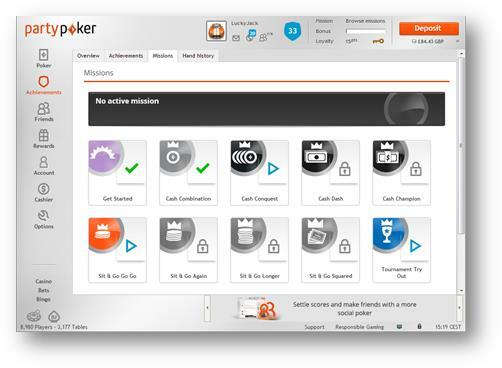 Since its November, 2013 launch, nj.partypoker.com has made various improvements to its software that are worth noting. Some of the new features that have been added include crisper graphics, quick seat, a tournament side panel (detailing important information about a particular tournament), customized player images (avatars, 4-colored decks, etc. ), hand history checking capability, and more options for multi-tabling. The site also provides an online poker school so you can brush up on the basics or, if you are already a seasoned player, fine tune your skills. Of course, to remain competitive with other online poker rooms, most sites have a loyalty rewards program, too, and Party Poker is no exception. Party Poker has five loyalty levels, which it calls Key Levels: Bronze, Silver, Gold, Palladium, and Palladium Elite. Every $1 you contribute to the rake in a cash game or spend on tournament fees earns you 2 points. Except for Palladium Elite, player standings are updated monthly based on the number of points earned the preceding month. The minimum number of points required each month is 250 for Silver, 500 for Gold, and 1,000 for Palladium. Players who accumulate 10,000 or more points per quarter attain Palladium Elite status. Membership in a given level begins as soon as the player qualifies and continues for at least the rest of that month or quarter and all of the next month or quarter. Palladium Elite players are automatically enrolled in the exclusive Palladium Elite Club, entitling them to lots of special exclusive VIP privileges. These include a personal host, bigger prizes and bonuses, bigger discounts in the Party Poker store, invitations to special tournaments and parties just for VIPs, and concert and sporting event tickets. You don’t have to be a VIP, though, to collect “achievement trophies” every time you have accomplished something noteworthy. Your achievements are displayed on your profile and you can brag about them to your friends. You need to be in New Jersey to play here. Quality of Customer Support could be improved. Welcome Bonus cap has increased to a most generous $1,000. Partnership with Borgata, the most successful casino in Atlantic City, means a bigger player pool and better guarantees. High amount of traffic means site is appealing to players of all stake levels. Pokerstes.us Conclusion: Based on the findings from our latest up-to-date Party Poker New Jersey review of this legal online poker site, it is understandable why Party Poker is No. 1 with New Jersey players. Party Poker isn’t for everyone. However, if you’re a fun loving and competitive person in the U.S. with a passion for poker and live in or expect to be visiting New Jersey, Party Poker is probably the right site for you!